At last month’s meeting of the United Nations Commission on Narcotic Drugs in Vienna, Bolivian President Evo Morales made headlines by dramatically brandishing a coca leaf he had apparently smuggled into the Austrian city between the pages of a book. The coca leaf, which is the unrefined source of cocaine and is considered an illegal substance under the UN’s 1961 Single Convention on Narcotic Drugs, holds special significance for the Bolivian leader. A former cultivator of the plant himself, Morales swept into the presidency in 2006 with the backing of Bolivia’s cocaleros movement, a syndicate of coca-growers unions Morales has helmed for decades. The standard-bearer of his own political party, the Movement Toward Socialism (Movimiento al Socialismo, MAS), Morales has faithfully conformed to the MAS platform. His tenure has seen the establishment of an intensely nationalistic, left-leaning government whose ambitions lie in the installment of a uniquely Bolivian brand of “Andean capitalism,” and whose support base is firmly rooted in Bolivia’s largely agrarian indigenous population. 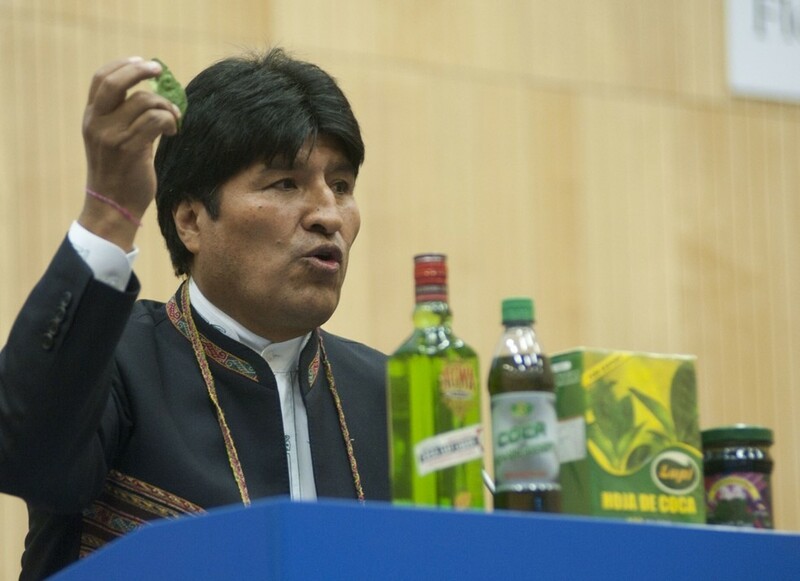 As President of Bolivia and leader of the cocaleros, Morales has remained true to his constituency, having instituted a policy of “Yes to Coca, No to Cocaine” (Coca Sí, Cocaína No). Under the policy, the cultivation of coca for legal purposes has been expanded, while the Bolivian government has ramped up efforts to crack down on the illegal production of cocaine. Meanwhile, Morales has lobbied for international acceptance of the coca leaf, citing its importance in Andean culture and touting its uses in everything from medicine and soap, to candy and liquor. As the third largest producer of cocaine, Bolivia represents an enormously important area of interest for the United States. The Andean nation’s drug policy is of vital concern to Washington, and so when the Morales government officially devotes 12,000 hectares—about 30,000 acres, though Bolivian coca occupies approximately triple that in reality—to the cultivation of a plant classified internationally as an illegal substance, the United States takes notice, and when it calls for 8,000 more to be set aside, that is doubly true. Thus, Morales’ advocacy on behalf of the deceptively innocuous-looking coca leaf, combined with his naturally outspoken demeanor, has left many U.S. officials ill at ease. Washington, traditionally in favor of the complete eradication of the plant as part of its ongoing War on Drugs, has in recent years endorsed alternative development programs. Yet the success of these programs, which subsidize farmers who choose to suspend their cultivation of coca in favor of other crops, has been limited, as coca is far more cost-effective than alternatives like coffee and rice, which are more labor-intensive and require more land to grow. And so while recent spikes in global food prices and renewed USAID pushes for alternative development models have made life without coca more feasible for the average farmer, the polarizing plant remains an attractive option for many Bolivians. Indeed, according to the U.S. State Department’s 2011 International Narcotics Control Strategy Report, although significant eradication efforts have been made under the Morales administration, they “have not resulted in a net reduction in the cultivation of coca,” and thus illicit cocaine production in Bolivia has held steady at an estimated 195 tons annually. The sheer size of Bolivia’s domestic cocaine industry, to say nothing of the vast amounts of the drug produced elsewhere and shipped through Bolivia en route to markets in the U.S. or Brazil, is of grave concern to the United States. And Morales, who expelled the American ambassador and drove U.S. DEA agents from the country in 2008, has done little to assuage Washington’s fears. Such tensions between U.S. policymakers and the oft-critical Latin American leader play into the larger narrative of Washington’s War on Drugs, as the U.S., in waging its patently ruinous crusade, has continually sought to pressure Latin American countries into falling in line with its own agenda. Hence, what Washington calls a warranted effort to cut the hemisphere’s flow of cocaine off at its source, many Latin American countries see as an attempt on the part of the world’s largest consumer of cocaine to bully them into footing the bill for the United States’ own problems at home. And for Morales, frequent critic of the U.S. and unabashed advocate of the coca leaf, the idea of scaling back cultivation of a potentially lucrative and culturally significant resource at the behest of such a bully is absurd. Consequently, so long as Washington continues to push for eradication in accordance with the failed War on Drugs to which it so desperately clings, La Paz—and Morales—will continue to be a thorn in the side of the United States. If Washington is interested in putting an end to the plague of drug-related violence that has racked the hemisphere for decades, then short of a full-throated endorsement of outright decriminalization, it must find willing partners. And to do that, it has to be willing to work with those who have their own domestic agendas to contend with. In the case of Evo Morales, this means recognizing that coca is not cocaine, just as wheat is not beer and grapes not wine, and acting accordingly. It means respecting a country’s millennia-old heritage, and it means opening the doors to a large and previously untaxed area of the market. But most of all, it means acknowledging that Washington does not have all the answers. This analysis was prepared by Alexander Frye, Research Associate for the Council on Hemispheric Affairs.